To get a true feel for the power of CMSs, you should test-drive a few for your HTML5 and CSS3 site. The wonderful resource www.opensourcecms.com allows you to log in to hundreds of different CMSs as a user and as an administrator to see how they work. Often, you have a special purpose in mind. For example, Moodle is useful for managing online courses. Student and instructor management: The system already understands the roles of student and instructor and makes appropriate parts of the system available. Online assignment creation and submission: One of the biggest problems with online courseware is getting assignments to and from students. Moodle has a complete system for handling this problem. Online grade book: When a teacher grades an assignment (online through Moodle), the student’s grades are automatically updated. Online testing support: Moodle has built-in modules for creating, managing, and scoring online quizzes and exams. Communication tools: Moodle includes a wiki (a collaborative documentation tool), online chat, and forum tools you can set up for improved communication with your students. Specialized educational content: Moodle was put together by hundreds of passionate (and geeky) teachers, so it has all kinds of support for various teaching methodologies. Community-created software can be very good (as Moodle is) because it’s built by people who know exactly what they want, and anybody with an idea (and the skills to carry them out) can add or modify the features. The result is an organic system that can often be better than the commercial offerings. 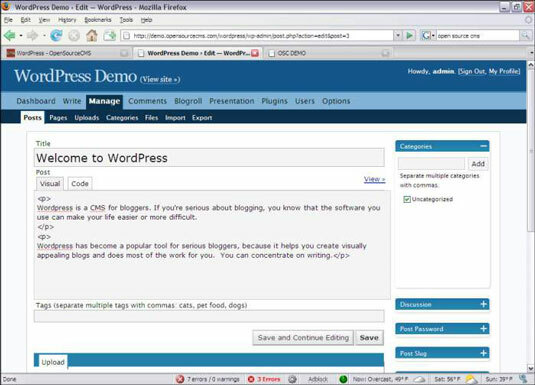 WordPress is another specialty CMS, meant primarily for blogging (short for web logging, or keeping an online public diary). 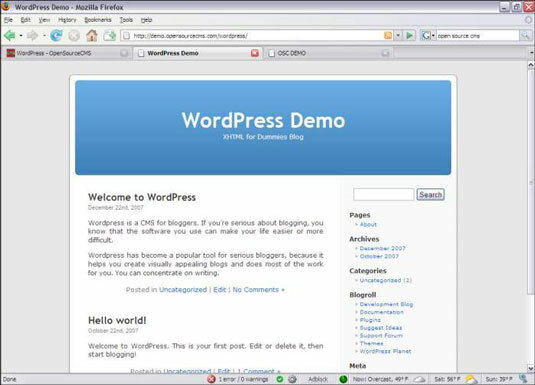 WordPress has become the dominant blogging tool on the Internet. WordPress takes one simple idea (blogging) and pushes it to the limit. Unregistered users see the blog output, but if you log in, you gain access to a complete set of tools for managing your online musings. Additionally, you can change the layout and colors, add new templates, and do much more, as you can in a more traditional CMS. Of course, hundreds of other specialized CMSs are out there. Before you try to build your own CMS from the ground up, take a look at the other available offerings and see whether you can start by using the work of somebody else. 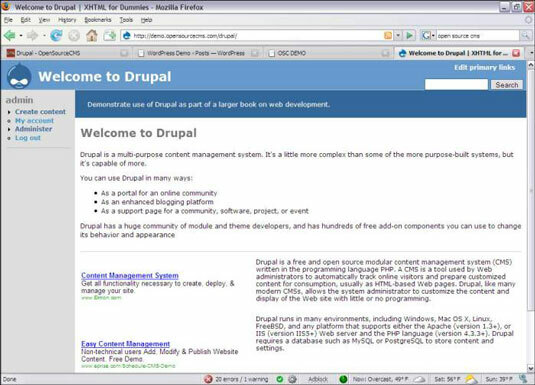 Drupal is one of the most popular multipurpose CMSs out there. Intended for larger sites, it’s more involved than the specialty CMSs — although it can do almost anything. 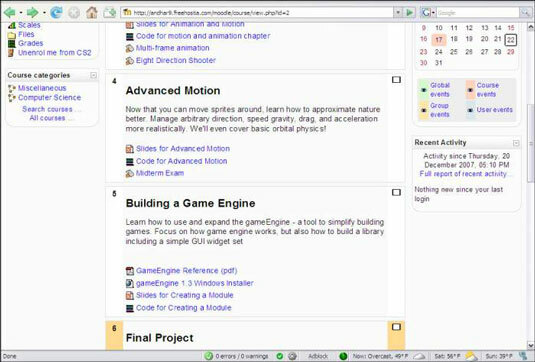 Gaming sites: Many game communities are based around a CMS like Drupal because it allows opportunities for users to share information, opinions, news, and files. Software sites: A CMS like Drupal is an ideal place to post information about your software, including downloads, documentation, and user support. Forums: Although you can find many dedicated forum packages, Drupal supports several good forum tools. Blogging: You can also use Drupal as a news site and a location to post your blog. You can add community features when you want or need them. Drupal is powerful and extremely popular. However, this power has led to increased complexity. Learning everything you can do with Drupal will take some time and effort. It’s easy to understand: Systems like Drupal have gotten so complicated that you often require entire books on how to use them. WebsiteBaker is not complicated at all, even for somewhat advanced features. It’s easy to modify: WebsiteBaker uses a reasonably simple template system that’s primarily HTML and CSS (with a few PHP functions thrown in). This makes it very easy to adapt pages that were not designed in WebsiteBaker to a CMS format. It’s easy to teach to clients: When you’re building a commercial site, it’s critical that your customer learns how to manage the site. The easier you can make managing the site for the customer, the easier your job is down the road. It’s reasonably complete: The basic install of WebsiteBaker is not large, but you can customize your installation with hundreds of modules and templates to get exactly the look and behavior you want. It’s free and open source: WebsiteBaker is entirely free and open source, even for commercial use.